Shopping for an RV generator can be confusing! That’s why we decided to add a new guide about the various types of gennies out there. RV expert Gary Brinck wrote this awesome guide for us, explaining what kinds of RV generators are out there, based on fuel type, wattage, packaging and more. Understanding what the different types of generators are is the first step in choosing the right one for your RV. There are several major choices to be made, plus some features that are standard on some models and options or not available on others. The engine in a generator can use gasoline, diesel or LP (propane), and some models are Dual Fuel Gasoline or LP. The choice between diesel or gas is largely driven by what you have most readily available. Diesel has a bit more energy per gallon than gas, but not enough to make it a deciding factor. But if you have a gas or diesel powered RV or tow vehicle, it generally makes sense to use the same fuel in the generator. Built-in generators nearly always do this and are fed directly from the vehicle fuel tank. A portable, however, requires that you carry extra fuel for it and that extra headache gives you more options. Portable fuel tanks are a significant safety risk, so think carefully about what fuel to carry, where and how. An LP gas fueled generator has some advantages and disadvantages. LP has lower energy content per gallon than gas or diesel, so more fuel is consumed, and portable LP bottles are heavy and bulky (but safer too). However, LP burns cleaner has less smelly exhaust and causes fewer carburetor problems than gasoline. That may make LP a worthwhile choice. Dual Fuel models (gasoline & LP), allow you even greater flexibility. Larger generators consume about 0.5 gallons of fuel per hour at 50% of their rated load. A 5000-watt rated generator, for example, will use 0.5 gallons/hour when producing 2500 watts. Diesel is a little less and LP a little more but in that ballpark. Small generators, though, sip much less fuel. A typical 2000-watt gas inverter generator can produce full power (2000 watts) for about 3 hours on a single gallon of fuel. If producing only 500 watts on average, the run time extends to somewhere around 8 hours per gallon. Generators can produce alternating current power via one of two methods, via Alternator or via Inverter. In the Alternator type, the engine mechanically spins an armature within a stator and directly produces alternating current. However, producing standard 120v, 60 Hz power, requires that the armature spin at a constant RPM, usually 3600 in inexpensive models and 1800 in the better grades. The RPMs must remain the same whether the electrical load is light or heavy, so Alternator types have a fairly high level of vibration and noise. If your electrical load (watts) varies much, an Alternator type if less desirable, but if you tend to run at heavy loads, it won’t make much difference. The Inverter type produces Direct Current with an engine driven generator and then uses that DC output to drive an inverter, which then produces standard 120vac. That sounds inefficient, but it has advantages that outweigh any loss there. The inverter is electronic and silent, and the DC generation is a variable RPM device. Operating at variable RPMs allows an Inverter type to throttle back when electrical loads are light, reducing noise, vibration and fuel consumption. Those advantages make an Inverter generator the top choice for most RVers. Generators can be Open Frame or Enclosed. An Open Frame generator is a kind you typically see around construction sites, with the working parts mounted on a metal skeleton with no covers. Aside from the aesthetics, that style is somewhat noisier because there is nothing to dampen the vibration noise. Open Frame generators are cheaper to build, though. Enclosed generators are better looking, often cleaner to handle, and a bit quieter. Here’s an example of an open-frame generator. As previously mentioned, generators are heavy. A 2000-2500 watt inverter generator weights 50-60 lbs, while a larger 3000-watt model will go 140 lbs or more. A 5000-watt model will go 230-250 lbs. As a practical matter, generators over 3000 watts aren’t really man-portable and will require some sort of wheeled cart to move at all. Lifting them in or out of a storage bay or the back of a truck is problematic. A very important aspect of a generator for an RVer is the type of power outlet(s) it has. They all have at least one or two residential style15A/20A outlets, but any one of those can deliver a max of 1800 watts. You can use an adapter (sometimes called a dogbone or dongle) to connect your RV’s 30A or 50A power cord to it, but you can only get 1800 watts that way. There are 3500-5000 watt generators that have only that kind of outlet. That’s fine if you have several things to plug in, but if you want to fully power a 30A RV, you need an outlet that can deliver 30A (3600 watts) @ 120v via one outlet. Preferably A TT30R outlet that matches your RV’s power TT30P plug. I’ve also seen generator outlets that are 240v and described as “30A”, but many of those only provide 30A @ 240v, That’s useless for a 30A/120v RV, even with an adapter. If you have a 30A RV, look for a generator that has an actual 30A/120v outlet so you can utilize all its power. For a 50A RV, there are two choices. When connecting to a smaller wattage generator, use a 30A adapter on the shore cord and plug in as described above for a 30A RV. If the generator is larger, more than 4000 watts, it will have to have a standard 4-wire, 50A/240v outlet to utilize fully. When it has a NEMA standard 14-50R outlet, your 50A shore cord will plug right in. If it has a round twist-lock outlet, you will need an adapter. There are a variety of extra features that may be of value. Parallel Operation is perhaps the most valuable one, but the others add convenience for some purposes. This feature, available only on inverter generators, allows two generators to operate together and combine their output power. Two 2000 watt units for example, become a 4000-watt generator. The Parallel Kit synchronizes the alternating current sine waves and provides a combined outlet with double the power. The kits are unique to a generator brand and model, so make sure it is available if you want to take advantage of this feature. Battery-operated electric start is almost a necessity for larger generators, but has become available for smaller ones now and can be a great convenience. Seniors and many ladies find it especially handy. Portable electric start models have a manual pull cord as well, so you can always get it running if the battery goes dead. Many smaller generators have a 12v outlet, usually with limited power (8A-10A @ 12v is typical). It can be used to directly power 12v gadgets and theoretically could charge a 12v battery as well. However, the voltage at these outlets is typically too low to be very effective as a charger and the amp rate is limited as well. Not a very useful feature for most folks, but handy if you have an application for it. Wheels are a great convenience given the weight of even a small generator, but pay attention to the size (diameter) and width of the wheels. Small diameter wheels don’t roll worth a darn on rough ground and narrow wheels sink in sand or wet ground. Do even you even need a generator for your RV? Most motorhomes come with built-in generators, but not so with most trailers (toy haulers are the exception). The simplest answer is for comfort and convenience when you camp off-grid (aka “Boondocking”). Whether for an extended stay in an isolated place or an overnight stop at a Walmart. You can use battery & solar power for many things, but when you want to use air conditioning or need to charge batteries on a rainy day, a generator is the only practical choice. It also serves as a substitute for an inverter and a large battery bank. An RV generator can provide power for other purposes as well, a compressor to inflate tires on your RV or an inflatable boat or as a back-up power source at home during power outages. Let’s learn a bit about the various ways to include a generator in your RV. They can be built in, which means permanently mounted in a storage compartment or in the garage of a toy hauler. 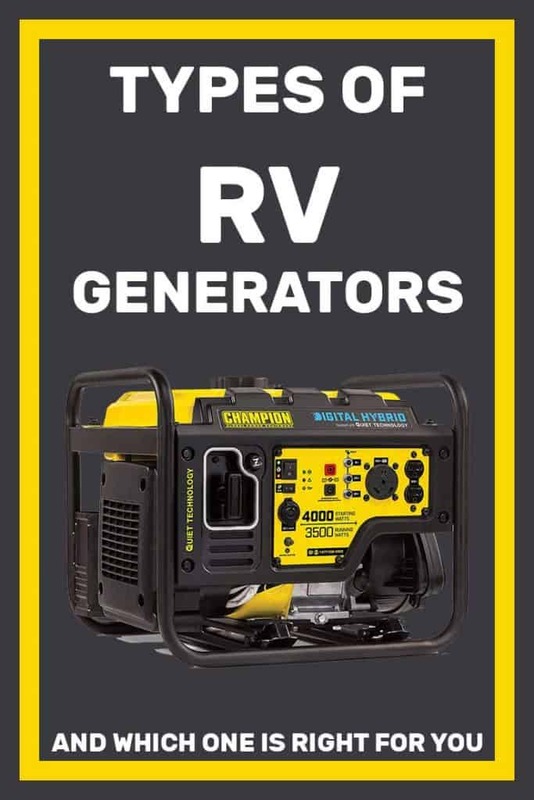 A built-in generator has a fuel source, exhaust system, the ventilation needed to provide its engine with air for combustion and cooling, and a connection to the RV electrical system. In motorhomes, the generator usually employs a fuel source already in place, i.e. the chassis fuel tank or the RV’s LP tanks. Some RVs come with what is known as Generator Prep, meaning a space has been designated for a generator but the generator itself is not included. Usually, the space has extra ventilation and wiring for a connection to the electrical system, but it typically does not have a fuel line or exhaust system in place. Often there is more than a little effort needed to complete the installation. Space may not always be large enough or the right shape for the type of generator you choose so measure carefully. 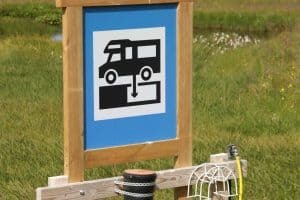 You also need to figure a way to carry fuel or connect the generator to a fuel source on the RV. The alternative to a built-in generator is a portable, carried in the RV or another vehicle and brought out for use as needed. Portable generators come in a wide variety of power (wattage), weights, sizes, and types – more on this later. A portable is great if you want to use it elsewhere than the RV, e.g. at home, power at local events, etc. Your popularity with friends and neighbors will go up once word about your portable generator gets out. Some trailer owners carry their portable generator in their truck, leaving it in the truck bed when operating. That’s handy for larger (heavier) generators that are too heavy to lug out onto the ground. Of course, if somebody drives off in the truck, the rest of the campsite has no 120v power. Aren’t Generators Noisy & Smelly? Frankly, yes. Some are better than others, but none of them could be called quiet and most have at least some exhaust smell. For these reasons, many campgrounds and nature parks prohibit or limit the use of generators. The most common restriction is “No Overnight Use”, prohibiting use from roughly 10 pm until 7 am. Others may specify allowable operation times, maybe 7am-9am and 5pm-7pm. Another type of restriction is noise level, with many National Parks requiring no more than a 60 decibel sound level measured at 50 ft. Make sure you know the rules at the location before you start the generator! Generator sound levels are measured in dB (decibels). The decibel scale is confusing to most people because it increases exponentially, like a slide rule. The quietest audible sound is 0 dB; 10 dB is a sound 10x that, but 20 dB is 100x the quietest sound. Thus a smallish difference in dB actually represents a large difference in the amount of noise. To give some perspective, a whisper is about 15 dB, normal conversation is about 60 dB, and a lawnmower about 90 dB. We all know that sound diminishes with distance, so it’s important to know the distance at which the dB was measured. Even a jet engine isn’t loud from a mile or two away. Sound level decreases with the square of the distance, so doubling your distance from a generator reduces it’s apparent volume by ¼. In practice, it’s hard to place your generator very far away at a campsite, so distances of 10-25 ft are common. If the generator you choose is rated at a reasonable 58 dB at 50 ft, remember that it will be 4x louder when only 25 ft away. It is possible to reduce generator noise at the campsite somewhat by placing it in a sound baffling enclosure. Because the frequency and amount of nose vary widely, usually these have to be custom made for the specific generator model and size. It’s more a matter of experiment than science. You can’t just wrap it in a box full of sound deadening foam cause the generator still has to get air for cooling and fuel combustion as well as removing exhaust. Exhaust gas smell can be a nuisance if the air is still or a light breeze blows toward the RV from the generator. A vertical exhaust pipe can be used to get the smell above people level (10 ft or so), or a horizontal flex exhaust tube can be used to direct the smell away to a less noticeable spot. Either one must be fairly large diameter because the generator engine is sensitive to exhaust back-pressure. There are commercially available exhaust tubes that might be adapted for use with a generator. How Big a Generator Do I Need? Determining an adequate size of generator involves making tradeoffs. Ideally, you would choose a size in watts that matches your RV’s shore power cord, i.e. 3600 watts for a 30A RV or 12,000 watts for a 50A RV. That would enable you to run everything just like on shore power. The tradeoff is that a higher wattage generator costs more, weighs more, is physically larger and uses more fuel. Weight and fuel are less of a factor for built-in generators, but for a portable, those are a major consideration. A typical 3600-watt generator weighs in at around 110-120 lbs, so not trivial to lift and carry. Larger power needs are mostly beyond what is practical with a portable generator. One approach is to just use the generator to power your battery charging needs and a few outlets, so no air conditioning or microwave use. A 1000-2000 watt generator is plenty for that and one that size is modest in size & price and weighs around 60 lbs. Running a single air conditioner, though, raises the ante considerably. An RV roof air conditioner requires about 1300 watts continuous, but it also has a brief start-up surge of 2500-3000+ watts each time its compressor starts. Different age and model a/c units can have different power needs, but it’s best to plan on a 3000-watt unit to reliably start an RV a/c and have a little extra power to handle battery charging and other small power needs. Honda offers a handy wattage estimating guide on their website – I suggest browsing through it to get an idea of your needs. Better yet, make a spreadsheet to calculate your total wants and needs. Generators have two power ratings, Peak and Sustained Load Watts. Sustained Load is what it can deliver for hours at a time, while Peak is typically 1-5 minutes. Even a one minute Peak is usually enough to handle the air conditioner start-up surge. With that in mind, a generator with a high Peal rating may enable you to use one with a more moderate Sustained Load wattage, More about this later. If you only need 3000 watts once in a while, there is a technique called Paralleling that enables you to use two smaller models instead of a single larger one. If you have two 1800-2000 watt generators, you can use just one of them for routine power needs and add the second when you have high wattage needs like an a/c unit. That means that much of the time you have the advantages of a smaller, lighter and quieter generator. Paralleling two generators requires a special feature that synchronizes them, so you need to plan for it when you buy the first one. We’ve covered the Parallel feature later in the section on types of generators above. As discussed throughout this article, selecting a generator involves a lot of tradeoffs. 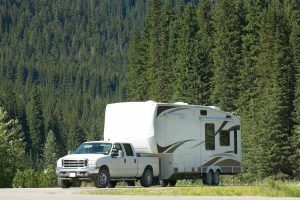 A large wattage model gives the ability to operate almost anything in or around your RV, but the penalty in weight, noise and cost is substantial. If you can exclude air conditioning from your needs, you can manage quite nicely with 1000-2000 watt generator, using it to operate the RV’s battery charger and powering a few devices (phone chargers, coffee pot, etc. If you need air conditioning, then two smaller generators and a Parallel Kit are a nice solution, but more expensive than a single larger generator. 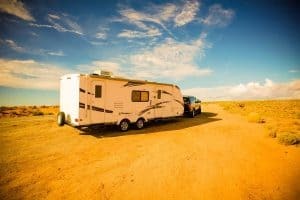 Last, if you must be able to operate your RV much the same as when connected to shore power, forget the portables and have a large generator built-in. Still need help? Try this concise step-by-step guide to choosing the perfect RV generator. Next PostWhere Can You Park an RV in Las Vegas?